His back is against the wall but Haitian prime minister Jack Guy Lafontant has no intention to resign, although every sector of Haitian society wants him to. Nope! PM Lafontant says he is ready to face the deputes this Saturday during his interpellation session. Will Prime Minister Jack Guy Lafontant stay or will he go? There are lots of surprises in Haitian politics, especially in parliament, so you never know what's going to happen until it happens. The prime minister made it clear to some members of parliament, senators and deputes alike that he wants to stay in his post. Saturday is around the corner, let's wait and see what happens. « Haiti - The price of fuel has not change and will not change. Stop poisoning the people's mind, " Prime Minister said. 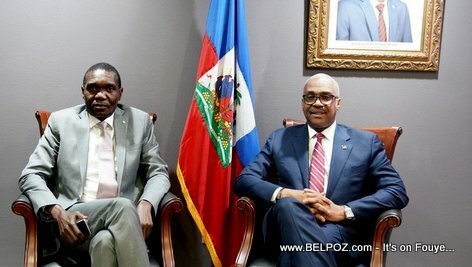 Son dos est contre le mur, mais le premier ministre haitien Jack Guy Lafontant n'a pas l'intention de démissionner, même si tous les secteurs de la société haïtienne le veulent.